As Americans shy away from the sugary soft drinks, they lunge towards innovative new ways to enjoy beverages. One sure bet in completing this mission is the introduction of homemade carbonation machines, or soda makers. Soda makers open up a world of creativity and are fun for all. The endless flavor concoctions are in tune with the imagination. Yet there are many other hidden benefits in owning one of these small machines. If you are new to the concept, let this little guide lend you some knowledge and prepare you for your very first adventure into home style beverages. We have also included the top 3 best soda makers 2016 to help you pick out a quality homemade carbonation machine. Imagine how often you run to the store to pick up a Coke or a fountain drink. While everyone craves that bubbly drink, there are better and healthier ways to approach this craving. Some people drink soda on a daily basis. This can get very expensive, and it can be wasteful with the empty plastic bottles and cans. Environmentally, this is becoming a huge problem as people dispose of millions of bottles daily. Soda makers are sleek little machines that are not counter hogs. They fit with any kind of kitchen décor. There is a huge variety of different models and brands in many different colors so you can match it to your kitchen’s color scheme. Soda makers are very user-friendly with simple operational procedures. By turning regular tap water into carbonated water via a CO2 cartridge and adding flavor, in less than 30 seconds you have built your own soda. Once you get the hang of a soda maker, you will discover short cuts and personal preferences in drinks. 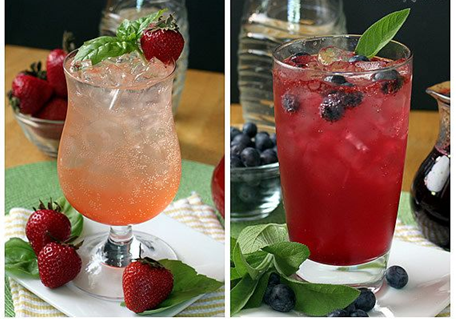 Some users will use fresh fruits, ginger, homemade syrups, and even alcohol for wine spritzers. This is why people are flocking out to get a soda maker, because they have the control to exercise individual taste in their beverages. There are many different brands of soda makers available on the market today. 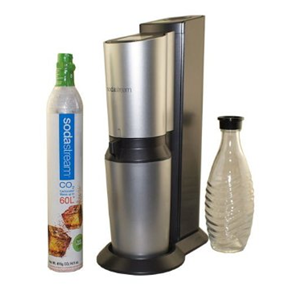 Probably the best known and best loved soda maker is the SodaStream. 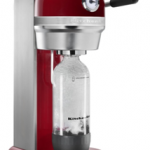 Later on, we will discuss these machines in depth, as SodaStream does have upcoming rivals as well as SodaStream carries 9 different models of machines. For now, think about all the reasons to get one of these carbonated machines. Environmentally Friendly- As mentioned above, plastic bottles and cans are a huge concern for landfills. While many people have become environmentally conscious with recycling, the majority of the population has not taken recycling seriously. One of the major benefits to getting a soda maker is the reductions of the amount of plastic waste involved. Another consideration is these machines do not use batteries or electricity to work the carbonation machines, making this another welcomed plus for the environment. Good for your Health- You health is in your hands with a soda maker. You can make drinks which are going to be better for you. Artificial flavors, high fructose corn syrup, and aspartame will not be ingredients in your own devised beverages. These ingredients’ found in regular soft drinks is known to cause health problems. Another great benefit to those who purchase soda makers is that the drinks that you make are better for you. The combinations you put together can have fewer calories and fewer sugars. Endless Varieties – This is where you get to include beneficial ingredients which are great for the body. For instance, fresh ginger, lemon, and turmeric are a 100 percent health booster. More often or not, you will not find flavors true to your health needs in a can of soda from the local supermarket. Family Preferences– Everybody in the family might have different likes and different nutritional needs. This is another great reason to own a soda maker machine. If children need healthier alternatives, juice and fruit make a great beverage. For adults wanting to engage their mixologist side, they can enjoy countless combinations of unique mixed drinks. These fantastic carbonation machines get the whole family in on the action, and soon store bought soda is long forgotten. A carbonation machine like SodaStream monitors sugar and calorie content, teaching children how to make better choices in beverages. 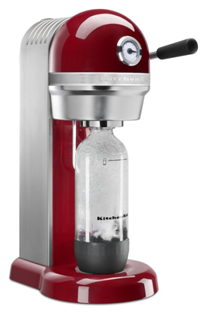 Carbonation Control –The soda maker machines allow you to control the level of fizz in your drinks. Some people prefer a lot of carbonation, while others don’t like much. You can customize to each person’s preference. Saves Money and Hassle- If you just have to have your soda on a daily basis, and find yourself running to the nearest conveniences store or grocer to grab your soda, this is a waste of time and money. And unless you recycle, you are contributing to the environmental problem with disposing of plastics and cans. You will appreciate the alternative with a homemade soda making system. In less than 30 seconds you can create your perfect soda. No Toxins in the Carbonation Bottles – chemicals are in your store bought soda, and some of these are quite harmful, if you consider long term health. Even the plastic bottles contain elements of chemicals. Homemade soda making systems provide reusable bottles either plastic or glass without the worries of harmful toxins. The cool thing about owning a soda maker is it does not require massive amounts of supplies to get the ball rolling. In fact, most soda machines have beginner kits which include a variety of tasting flavors with the machine to help you learn more about the machine’s potential. Much of the supplies will come right out your own kitchen. Once you have bought one of these amazing machines, you will be fast to discover just how simple and available other supplies are. Here is a basic outline of items to include in your soda making experience. The Soda Making Machine- There are many to choose from. 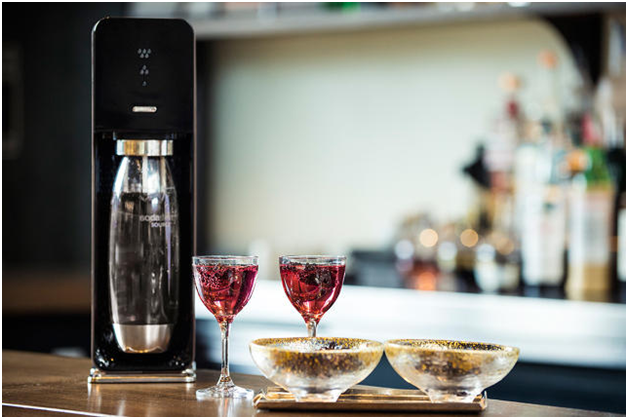 While SodaStream remains the top contender in the market, rival companies are now starting to produce their own variation on these carbonated machines. Remember, they are not going to take up much space at all on a counter, and you can purchase them in all kinds of shapes and sizes. Soda making machines typically do not require batteries or electricity. By incorporating a CO2 canister supplies the bubbles into the chilled water. Gas Cylinders –The carbonation system is nothing more than a CO2 canister which fit inside the soda machines. Each one can fizz around 50 pints of water and most of these gas cylinders are rechargeable. These cartridges may feel like your biggest expense upfront, but if you do the math you will realize the savings involved. Many times the companies will include great rebates to help offset this expense. Carbonating bottles – All the manufacturers of home soda making machines include special bottles, some are plastic with glass being a more expensive option. The big deal here is they are reusable. Just rinse and reuse. These are special bottles that you use to create any number of different flavored carbonated drinks. They are also reusable, so no need to throw them away when empty. Just rinse and reuse. Flavor Mixes – Soda without flavor is just bubbly water, more like sparkling water. Here is where your imagination gets to play with flavor preferences. You can opt for regular soda flavors such as the colas, orange, or even root beer. There are also diet versions available. SodaStream carries over 60 flavors which also include energy drinks, juices, and cocktail mixes. 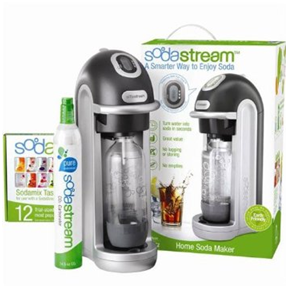 SodaStream recognizes the market leaning towards less sugar syrups and is introducing more health conscious flavors with their products. The availability of soda mixes is abundant online and can also be found locally. Most soda makers will come with a taster’s pack for the consumer to try. Each soda mix bottles make about 12 liters of soda. The bottles included in the soda maker packages are 16.9 ounces. Now that you have the basics of knowledge of home soda makers, we have the top best 3 soda makers picked out to help make the decision easier for you. This one makes top pick for a couple of reasons. One, the Fizz model by SodaStream is not a budget-breaker at only 80 dollars; this offers customers a chance to try out the system. Two, this is a complete starter kit, which means it includes a sample taste kit. Consumers will be able to play around with the different flavors and find their own unique singular or combination soda. While the cost is significantly higher at 190 dollars; this soda machine remains one of the most popular purchases on Amazon for home soda machines. It is a separate brand from SodaStream, but still carries the ‘powered by SodaStream’ claim. This is a solid die cast metal housing design with a soft grip handle; making is easy to create carbonation. The big bonus is the compatibility with all SodaStream products and flavors. Even if you are new to the homemade soda making scene, you will find it to be the easiest process, with the only challenge being getting the perfect amount of fizz in your beverage. It is advised to hand wash all carbonating bottles and soda maker and not put them in the dishwasher. Tip: Chill your water before creating a beverage. This is going to improve the overall taste and yield the best results. Chill the water to just a few degrees above freezing. Some people swear by using filtered water (especially if there is a chlorine reducer in the filter). While there is a huge selection of excellent soda making machines on the market, our next pick is another people’s choice in home carbonation machines. This stainless steel variety is compact and sleek, making a delicious soda in less than 30 seconds. This particular model includes award-winning crystal cut-glass. With one touch of the button it dispenses a bubbly variety of fresh sodas, energy drinks, or even Italian or ice cream sodas. This model is small and fits into any countertop corner and very easy to clean. The price is a little more at 179 dollars due to the quality of materials used. Once you set the soda maker up, it is time to put in the carbonator and reset the meter. Fill the carbonation bottle full cold water, pull out the tilt out level and screw the bottle on tightly. Press down on the carbonating switch. Some machines include buzzers, which alert you to the various stages of fizzing. For instance, one buzz may mean lightly carbonated, and three is the middle area while five loud buzzes equal the amount of carbonation used for cola drinks. The chosen flavor is added after the water is carbonated. If you are using pre-mixed syrup, follow the directions. Once you get the hang of how syrups and carbonation react and mix, then you will discover using your own fruit juices and other home ingredients. The best thing about owning one of these fabulous home carbonation machines lies in the Experimentation. This can be fun for everyone in the family. Once you have become accustomed to the soda making machine, you will inevitably find new ways to use it and even more ways to save more money. Paintball tanks are cheaper – CO2 tanks refilled are sometimes costly, but with only a simple adaptor, you can easily switch out the regular CO2 cartridges for a paintball CO2 tank. There is a large price difference between the soda maker CO2 tanks and paintball tanks. Use Frozen Concentrate – When you are craving a fruity soda, you can use frozen juice concentrate. This is the most inexpensive and easy way to create an excellent fruit soda. For the best taste, use 1-2 tablespoons of the concentrate into the carbonated water. Don’t put the concentrate into the machine itself. Carbonating – This can get exciting when you consider making old fashioned ice cream sodas or adding carbonation to wine to create delicious champagne. How about hard lemonade or a signature mixed drink? Be careful about adding anything other than water to the soda maker and remember to use liquids that are not mostly sugar. Snow cone syrup can be used from some of SodaStream syrups. The dilution ration is 1:6 for snow cone syrup to 1:34 for regular soda stream syrup. This makes for a great summer time option.